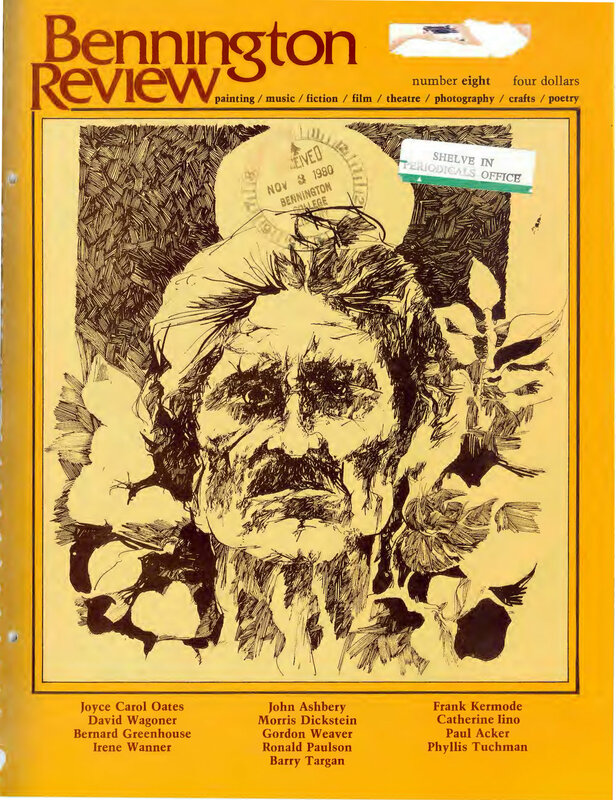 Back in 1980, New Yorker editor David Remnick, then an undergraduate at Princeton University, conducted an interview with the poet John Ashbery (1927-2017) for an issue of Bennington Review. Here they talk of Ashbery’s (supposed) influences and his interest in surrealism and syntax, as well as the potential risks he saw in confessional poetry. This historical document captures Ashbery's thoughts and insights just a few years after his trifecta win of the National Book Award, the National Book Critics' Circle Award, and the Pulitzer Prize for Self-Portrait in a Convex Mirror. Were books very important in your home? Not in my home, my parents were not intellectual at all. But my grandfather loved books. He was a college professor of physics but he also read a great deal. He knew Greek and Latin and read novels and poetry. I enjoyed visiting him to go through his library. Did he start you off with anything in particular? He used to read to me at night, which I enjoyed very much. It was the usual collection of children's classics. I remember one book he read to me that I liked very much was Nathaniel Hawthorne's Wonderbook and Tanglewood Tales about the Greek myths. He also had a very nice Victorian edition of Shakespeare with rather eerie illustrations. Of course, I didn't understand very much of it but I relied on Lamb's Tales from Shakespeare and then would sort of dip into the plays. He also had complete sets of Dickens, Sir Walter Scott and Thackeray. There was Shelley and Byron and Longfellow; but I didn't read much poetry when I was young. Do you think poetry is more prohibitive than prose to a young reader? It was for me. I imagine that before I had read any modern poetry I had the same inhibition about reading poetry that most people have all the time. They say, "I don't know how to appreciate this, it's something that I don't know anything about." There is the feeling that you have to take some kind of course before you can understand a poem which I think prevents people from reading poetry. They think that you cannot simply open a book of poems, start reading and instantly enjoy it. I discovered later on that wasn't true. The poet Charles Wright says that very often the first poet one reads with real passion has a permanent effect. Do you think that happened to you to any degree? Yes I do. In my case, the poet is W. H. Auden. I am usually linked to Wallace Stevens but it seems to me that Auden played a greater role. He was the first modern poet that I was able to read with pleasure. I was about fifteen or sixteen at the time. I see not so much resemblances but a similar way of personifying and of making things concrete. Not many people see this in my work and I don't think Auden himself did either. He had selected Some Trees for the Yale Younger Poets prize. Did you work with him all? No, I didn't. The prize came about in a curious fashion. I knew Auden slightly but I didn't dare show him my poetry. In fact, poets nowadays are much more nervy about thrusting manuscripts on older poets. It happens to me a lot and I hate not to reply because I know how important it was to be encouraged at that age. But there is a limit to how much one can do. Anyway, I don't think Auden was ever that enthusiastic about my poetry. I had submitted to the Yale competition according to the rules by sending my manuscript to the Yale University Press where it was screened out and returned to me. The same thing happened that year to Frank O'Hara. A mutual friend, Chester Kallman, told Auden about us. He had decided not to award the prize that year—he hadn't liked any of the manuscripts. So, he asked to see our manuscripts and ended up choosing mine. He wrote a somewhat disaffected preface in which he compared me to Rimbaud—which was very flattering, of course—but I don't think he meant it as much of a compliment since he was very anti-French . Someone told me that he had asked Auden a few years before he died what he thought of my poetry and he said that he had never been able to understand a line of it! What do you think you specifically learned from Auden's poetry? It's very hard to talk about influence, especially about one's own influences since they really don't work in that linear way that literary critics would like to see. In the process of writing you may flash on some poem that you read years ago and it will influence you to twist your line in a certain direction but other than that, it's difficult to tell. What struck me about Auden was the unpoetic language he was using. It first kind of put me off and then began to interest me very much. There is a journalistic tone sometimes or a chatty conversational voice or the kind of primitive Middle English type of voice he used even before the Age of Anxiety. Do you see your conversational voice or the voice you hear as you think as your poetic voice? I don't know what the voice of my poetry is. I suppose it's mine but it is a part of me that I'm only in touch with while I'm writing. I don't see it as like my conversational voice or like anybody else's voice that I know. It is a voice that occasionally intrudes in my ordinary thinking. Suddenly a line of what appears to be poetry will pop into my mind and I will have no idea where it came from. One of your early poems, "The Picture of Little J. A. in a Prospect of Flowers," strikes me as having been given a first line if not a first stanza. The suddenness and force of the first stanza seems as though it could only have been the result of a spark of imagination rather than long labor. But that is the fine poet's illusion, I suppose. I was 22 when I wrote that. I remember I was reading Moll Flanders at the time. The part in quotes was undoubtedly suggested by that novel. The epigraph from Pasternak is from his autobiography Safe Conduct which I had also read shortly before the poem was written. Do epigraphs work for you the way titles do, indicating how the poem might be read? The titles sort of aim the poem in a certain direction which it may not seem to be going in and it adds for me a certain dimension to the poem, indicating, as you said, how it can be read. The epigraph does that a little, too. I don't use them that much and I always feel a little uncomfortable about it. It's like dragging in some distinguished authority to back up my poem. This particular epigraph has always struck me as being a little self-congratulatory, though I meant "spoilt" to be understood as "damaged," not "pampered." And it seems to me that you usually do not use literary quotations or allusions very often or very overtly the way Eliot did. I don't think my poetry is very bound to a literary tradition. But it is, somewhat more so than some critics maintain. A lot of people throw up their hands and say that I am writing poetry that isn't poetry at all. I don't think of myself as being a destroyer of poetry and I think I am continuing, in my own way, from a body of poetic tradition. Like almost any other poet I can think of, your early poems, while demonstrating a certain individuality also showed a certain degree of imitation. Yes, imitative of Auden and others. The poem "Some Trees" is somewhat influenced by Marianne Moore and the poem "Le Livre Est Sur La Table" is very imitative of Wallace Stevens. Poems earlier than that—which I have not collected—are much more derivative. I think you really have to imitate in order to find out what your voice is. You have to speak in the voice of the poets that are important to you even though you may not be aware of doing it. I wasn't consciously aware of imitating Moore or Stevens in either one of those poems but I realized it afterwards. Harold Bloom, a critic who has praised your poetry for many years now, seems to want to draw, from Whitman to Stevens to Ashbery, a very precise line of literary influence. What is your reaction to his analysis of your work and its influences? I read his criticism very much the way I read poetry. In other words, I think he's making statements which are true in their context, just as the statements in the poem are, but which are not being proposed as ironclad principles. In that way, I think they are valid. I once told Harold Bloom that I had read almost none of the poetry of Emerson—who he says is one of my precursors—and Bloom waved this aside by saying that I had been influenced by him nonetheless. He didn't want to hear about my lack of knowledge. I think he is careful to emphasize that his own judgments of poetry may be misreadings like someone else's. . . .
Like another poet's misreading . . .
Or like another critic's misreading. That is very central to the importance of his critical writing. As I said earlier, I don't understand very much about influences. I think they may be imputed by a critic to enhance his own critical argument, and may even be valid, but an influence's way of operating while one is writing is very oblique. One is being influenced all the time by so many other things-not just poetry but also climatic conditions, the room one is in, whatever—and these other things are important, too. Bloom also says that you and other poets suffer from an anxiety of influence whenever you feel yourself writing in what you feel to be a derivative mode or voice. I think his theory of the anxiety of influence has a poetic truth, as I've said. I, myself, am not conscious of feeling it while I am writing but I am anxious about so many things that this may well be one of them. But it goes by too quickly for me to be cognizant of it. You've translated from the French several authors like Breton and Roussel. Does translation affect your work in any way? No, it might if I did more of it. I've always wanted to translate more works from the French; there are so many important French writers who have never been translated into English. The one case, however, in which translation did work in an influential way was my work on a long section of Giorgio de Chirico's novel, Hebdomeros. I found that the very curious style of this work got into my own work and would keep recurring long after I had done this translation. It was 1964, I think. When I go back and reread that book, I am aware that there are echoes of it even today in my poetry but I was never aware of those echoes while I was writing my poem. It is a particular tone or syntax in de Chirico . . . It's a slightly ironical, rhetorical tone. A very expansive tone. His sentences go on for pages in the novel and, in the course of them, very unexpected things will happen. Sudden shifts and inversions. Again and again, one critic or another will suggest that because so many of your friends over the years have been painters, your work must have been influenced by Willem de Kooning, Larry Rivers and the rest. Undoubtedly, what I've experienced in this way has gone into my poetry but it has done so in ways that I am not conscious of. In fact, I would really rather not be conscious of influences because I can work better that way. What I was referring to in the case of de Chirico's Hebdomeros is a much more subtle kind of situation. Has criticism of your own work ever affected you? Have you ever moved in a direction suggested by a critic? I fear that it has worked in the opposite sense. It has, perhaps, made me more willful about retaining the things being criticized. I have always followed the advice of Cocteau who said that you should read the criticism of your work and then continue to do the things that are meeting with disapproval. I hope, though, that I haven't been propelled too much in this direction which would also be a false stimulus. Something that interests me very much is the way a young poet begins to develop his or her own unique voice and whether or not that voice is created consciously or unconsciously. I don't really know what kind of voice my poetry has because it's always changing, or at least I hope it is. But it cannot change much because it is always me or some form of me. I went through a period of uncertainty after I published the first book which is reflected in the confusing poems of The Tennis Court Oath. The poems in Some Trees had for me a sort of finish to them that I couldn't seem to achieve satisfactorily again in the same way. That second book has a surrealistic spirit to it; was that an early interest? Yes. In fact, I first heard about surrealism when I was ten years old. At that time, the Museum of Modern Art had a big show of surrealist art which was reported in Life. I thought these pictures were marvelous and decided at that point that I would be a surrealist painter. I did some crazy paintings in art class which had a certain amount of success with my fellow students. I think one of them is in the collection of the museum in Rochester in the reserves somewhere. The painter who was at Deerfield was opposed to all this: he was a much more conservative artist. He said it was all right if I wanted to be a surrealist painter but that I first had to learn how to draw. Do you think it is legitimate advice to say that you must first learn how to draw before you can paint surrealistic work or that you have to write sonnets and sestinas before you can write in free verse? Not always, no. It depends on the individual. Some of the abstract expressionist painters, for instance, began in a very traditional way and others proceeded to paint abstractly from the very start. I rather enjoyed the traditional work more than my first experimental attempts. So, in my case, I guess it was good advice. No, I sort of got bored with it. It's much easier to write poetry in certain ways: you don't have to wash brushes or cope with easels. William Carlos Williams is quoted as having said that it was easier to carry around a manuscript than a wet canvas. I don't think there was much room to paint in college either but I suppose that if I had been hooked on painting, I would have continued. I just let it lapse. You have said elsewhere that if you are to be stuck with a label it would be the label of Romantic rather than surrealist. As a poet related to the romantic tradition, you write about some kind of self. At least you use the pronoun "I" a great deal. But do you think there is in your own work a certain distance from "real life experience''? I don't think I write about my emotional experiences although they certainly condition the writing that comes out of me. You can see from reading my work that I don't talk about my life, which never seems very interesting to me. Therefore, I would not want to bore anyone else with it. Do you think writing about one's own life is dangerous in that sense? Confessional poetry does run the risk of turning off the reader. It's like telling someone about your operation. My reaction is always that I have suffered too, like everybody else, so why don't we forget about it and get down to business? The poetry seems to lie elsewhere. You see I am trying to discover things that I am not already conscious of. Rather than deal with experiences from my past which are already familiar to me, the excitement of writing poetry for me is to explore places that I have not already found. Heidegger says that to write a poem is to make a voyage of discovery. In the same way, I am always interested in my future poems rather than the ones which I've already written. The old ones really don't do anything for me. Don't you feel at all close to early poems? The early ones are so far in the past that I can hardly imagine what kind of person I was when I wrote them. The more recent ones are a little closer. I tend to like the last poem I've written. When a confessional poet like Plath or Lowell writes well, he or she has somehow taken the real event and transformed it in some way, giving the reader the emotional rather than the journalistic equivalent of that event. Is that kind of practice of no interest to you? I'm only talking about the way I write. I'm not advising anybody else to do as I do. Take "The Picture of Little J.A. in a Prospect of Flowers," for instance. It does talk a little about a picture taken of me as a child but I invented this photograph. My family took a lot of snapshots of me but there is no picture of me where I am standing in a prospect of flowers and there is no phlox in any of them. In none of them does my head look like a "pale and gigantic fungus." The moment of the shutter clicking is invented also. You grew up in a very rural area of New York State and later on you spent nearly ten years in Paris writing art criticism for Art News. You had to speak a foreign language for that period of time. Do you think this kind of isolation might have affected your poems and poetic language? Some have called it a "private language." I don't think of my poetry as being private in the sense that it is only related to me and I don't want other people to share in it. I mean it to be about the privacy that each of us feels. We are all private people. There is nothing we can do about that. In this way, I think my poetry is actually more public than private. What I want to do is illuminate the ways in which we are private individuals who are, perhaps, capable of breaking through that. It would be nice if we were part of a community that consisted of private but public individuals. As for my background influencing my kind of private language, that could be so. I think I was already a pretty private poet by the time I had finished Some Trees, before I went to France. But I don't think of myself as a hermetic poet. Even in The Tennis Court Oath which has very enigmatic and fragmented poetry—my desire at the time I was writing the book was to be surrounded by American speech again. I used to buy American magazines and newspapers and make collages out of them as a way of plugging myself into our way of talking and thinking rather than turning away from it. Laid out here on the table, next to copies of the Paris Review and Art News, are the National Enquirer and the New York Post, two especially lurid papers. I confess that a small part of my admiration for your work has to do with this embrace of popular culture and journalism in your poems. When did you first find yourself addicted to newspapers? I've always been a great consumer of newspapers and am sorry that there are so few of them in New York these days. When I was living in Paris, there were four or five daily newspapers and I'm afraid I spent a great deal of time reading them every day. I'm not sure why this is, and I don't know that I'd advise anyone else to do it. It seems like a kind of vice, like a craving for junk food. Yet, the news of the day frequently has the very awful but magnificent shock of a great poem. Are you similarly interested in movies or TV? Even while I'm cringing, I very often enjoy the television commercials. Mainly I watch TV for the old B pictures that I may have seen as a child. They recreate a part of the past for me that is still a part of the present. I think one misreading of your interest in popular culture is that you are only satirizing journalism or advertising. It seems to me you are retrieving some beauty from those cliches. Some things have to be satirized so that they may be celebrated, and that may be what I am doing. Poets sometimes rebel against the notion of the poet as a disembodied spirit. They wish to bring into their poem their own ordinary individuality, what Delmore Schwartz called "the individual who catches cold and drinks tea." "Rivers and Mountains" is a poem that I think is a kind of melding of styles in your career: it seems to embrace the quirky language of The Tennis Court Oath as well as the more controlled syntax and diction of Some Trees. That particular poem was written after I had gone to an exhibition of Oriental scrolls in Paris. Again, I guess there is an influence of art on my poetry but it doesn't seem to do much more than take me up to the poem and then leave me on my own. It was a Korean landscape scroll. The line "On the secret map the assassins I Cloistered," was sort of given. I wondered about the word "cloistered" which seemed so odd and inappropriate but I've learned since then that these refractory little bits must often be retained. It's not a political poem, however. It was written before Kennedy's assassination. The image of the assassins came from Fritz Lang's film, Spies. Three Japanese men are sent to deliver a letter and you see their ghosts returning to deliver it. They had all been assassinated. "The affliction of June" . . . I always seem to get depressed in the month of June. Not that everybody is-but I frequently am, so in it went. This was one of the earliest poems in Rivers and Mountains. At that point I was feeling dissatisfied with the automatic and disjunct poetry of The Tennis Court Oath which were poems that I had really meant for myself. I didn't think I was ever going to publish another book of poetry after my first one. The Tennis Court Oath poems were an attempt to see what I wanted to do by taking poetry apart. I hoped to put it all back together again in a way that would be more interesting to me than the poems that I had written in the style of Some Trees and did not publish. As it turned out, I had an opportunity to publish a second book of poetry. The poems that I had were private, not because I am narcissist but because I assumed I would never have an audience. ''Rivers and Mountains" seems to me to be a synthesizing in a new way of the styles that I wanted to continue in. It has a kind of automatic quality to it. Can you describe the writing of the poem? It does have traces of the experimental language of The Tennis Court Oath but it seems to have a smoothness and roundness (I tend to use plastic terms when I speak about poetry) which the earlier poems didn't. For example, I write "Wrinkled on the plan / Of election to public office/ Sixty-two years old bath and breakfast. . . ." After some relatively straightforward description it suddenly veers into a kind of gibberish there. You don't know who this person is who has popped into the poem. Also, the ox and the shadows are all pretty mysterious but then it resumes in a more logical way about a fantastic landscape and a war. To "quietly move among the rustic landscape" is not something I would have written if I had done the poem at a later date; the word "among" seems too perverse. I wouldn't change it, now, though. If I were to change it, I think it would really take something away from the poem; a more normal preposition than "among" wouldn't give the same picture. As for the writing of the poem, I think I sat down and just wrote it. I usually write quite quickly. At that point, I had not begun to write on the typewriter as I do now. I began with a typewriter with the later poem "The Skaters" because I was using such long lines that I couldn't remember the end of the line by the time I had gotten there. Since I type fast, I changed to that. I think it is very interesting that you are willing to explicate the literal sense behind phrases like "the affliction of June" because it serves to allay that fear of difficulty so many critics have attributed to your work. You seem to say that these little explanations you have given here are personal, but really superfluous, and that no academic research is necessary to read a poem like "Rivers and Mountains." Yes, those phrases were irregularities that I decided not to leave out. I think one of the things that one picks up on after a certain amount of time is the ability to distinguish what seems to be blemishes and what are necessary distortions and irregularities. I was once discussing with my friend, the painter Fairfield Porter, someone's definition of a portrait as a painting of somebody where there is something wrong with the mouth. Porter felt this was true and said that he once had the experience of correcting that error in the mouth and having the painting go dead. This can happen in poetry, too. Did you finish the draft of "Rivers and Mountains" in one stretch? Yes, it probably took a half hour. I think I corrected it the next day and typed it. I don't think I changed it very much. At that time, I edited and corrected my poetry more than I do now. These days I usually sit down to write with a few sketchy ideas and write very rapidly. A new poem in As We Know, ''Haunted Landscape," went without any changes at all. That sort of composition must require a tremendous amount of attention and concentration. What is most baffling, though, is where one focuses one's attention. Is it intellectual attention? I don't think it is intellectual at all; I'm aware that I can command this attention when I need to and therefore I don't plan anything, really. I will start perhaps with a title and a few words or phrases that I've had in my head. By free associating from those seeds of the poem, I begin to write. It is sort of like a high when I write. It's kind of painful and pleasurable at the same time to be so attentive. It's nice when it's over, too. Have you ever experimented with meditation? No, the process of writing is enough. I really don't know where the poems come from. It is very mysterious to me. In that way, the power of poetry never fails to confound me. Do you ever feel a little like a middleman between Poetry and your poem? Yes, I feel almost as if I am taking dictation. I don't want to make it seem as if I write in a trance or anything like that. It's not that. It's a matter of feeling very much more awake than usual. But I don't think younger poets can expect to command the kind of attention and concentration you describe because there is just a lot less experience, reading and writing practice informing their capabilities. I hate to generalize, but in my case, it did take a long time to get that ease. I used to rewrite my poems and work on them a great deal. Since I am sort of lazy but also like to get things done, I must somehow have trained myself not to write something that is going to require much editing. Why put forth a useless effort? It's a question of practice. If you do anything long enough you are going to gain a greater facility. You have experimented with many different formal structures: the pantoum, the sonnet, prose structure in Three Poems, dixains in "Fragment" and William Carlos Williams-like lines in "The Thief of Poetry." Are those forms also "given" or do they grow out of your lines and subject matter? I'm always looking for something new to do. ''The Thief of Poetry" looks like a Williams kind of poem. I guess I wanted to see one day if I could write in an abbreviated way. That might have been a conscious decision but the content of the poem came during the writing. In the new book, As We Know, you have that very long poem written in two columns. Yes, it's called "Litany." I wanted the two columns to be presented together. It's written with the idea that one is hearing two different voices. In Cincinnati, where I read from it the other week, I had another man read with me at the same time. It seemed to work very well. I also read it in New York with a woman reading the other part so that the voices would be even more dissimilar. I told the audience that the point of doing this was that there would be an awful lot that they would miss, and I intend that. I was thinking of the poem in musical terms, possibly influenced by some of Elliot Carter's music. He employs a kind of dialogue or conversation between the instruments very often. They are almost characterized. In Ives' work, the Second String Quartet I believe, he indicates in the score that one of the instruments has the name Rollo. Rollo is constantly screwing things up and making a mess of what the other instruments are elaborating. In Carter's work, there will be a point where one instrument tends to dominate and it will have a specific character, perhaps more grave or eloquent or rational than the other instruments. Although you cannot follow the patterns of these clashes, what is precisely interesting in the music is the way in which the voices bounce off each other and illuminate each other momentarily. In a way, these new poems are a re-examination of the experiments in The Tennis Court Oath which had never interested me much until recently. I went back to them and realized I liked them more than I had thought. How long did you take composing "Litany"? About six months. I wrote the poem one column at a time, page by page. One day I would write on the left hand side of the page and the next day on the right, until I had finished. The recent spate of reviews of As We Know is a reminder that for some time now each one of your books is greeted with a great degree of confusion; everyone seems to want a key to your work. Once when I was at Johns Hopkins I was asked to discuss my work and answer questions about it from students who were very perplexed by my explanations. Richard Howard, who met with the same group of students, said that the students wanted a key to my poetry and I had only presented them with a new set of locks! You've taught writing classes in Cincinnati and Brooklyn, among others. What are the most common problems with the students' work? There are a lot of problems, obviously, as many as there are poetry students. One problem is that many of them write in a widely used genre that seems to come out of Iowa. Although they are often perfectly acceptable and even gifted poems, they are being mass-produced all over the country. What kind of poem is that? How do you help students break out of that kind of rut? I might give them formal assignments maybe. I like forms that occupy the conscious mind to the extent that the unconscious is liberated and can go about the business of contributing to the poem. I use the sestina, the pantoum, or the canzone—which is a form I discovered in Auden. There are not too many forms that I feel have that liberated quality; a sonnet, for instance, doesn't work in that way because it is too loose. I also have them do translations of texts from a foreign language that they do not know. They look at them and try to imagine what the words might mean, to fantasize on their meaning. Often the result is very interesting. Sometimes I will use pictures. I have some rebus pictures from an Italian puzzle magazine called La Settimana Enigmistica, in which there is a strange scene with objects that don't seem to belong together. Or I'll have the students write from a different point of view, say from the point of view of a person who is suffering from a particular mental disorder. A friend told me about Georges Perec, a novelist who is interested in restrictive literary forms and who published a novel in French without using the letter E. As you would imagine, that makes for a very odd narrative. Already you cannot use "Je" or "le" or many words that seem essential. This friend, the novelist and poet Harry Mathews, also told me that he had a class of his take a poem and change every word to its exact opposite in meaning. A definite article becomes an indefinite article, white becomes black. He said that one of his students had taken my poem "The Chateau Hardware'' and made something very beautiful by turning it around. The point of all this is to bring the unconscious mind to the poem. Your poem "Farm Implements and Rutabagas in a Landscape" is fascinating in its use of cartoon characters and cartoon voices. I wonder how you came to that. Cartoon characters appear in quite a lot of my poems and, of course, my first literary experience was comic strips. In a way, it may have been my strongest one. I've always been fascinated by Popeye. The Spanish language newspaper in New York, El Diario, has it in their Sunday edition and I think it's about the only place where Popeye still appears anymore. I used to buy it occasionally because I liked the colors; it was funny to see these familiar characters in a language which I don't read. The "green couch" in la casa de Popeye comes from one of those strips. The title comes from a master drawing from Sotheby's auction list. When I was working for Art News, one of my jobs was to type up the auction column. A friend of mine pointed out that old master drawings have been given these strange titles by people other than the artist. He mentioned one called "A Flying Figure Approaching Two Standing Figures.” I only realized it after I had written the poem, but I think it is like the play L'Arlesienne by Daudet which I had read when I was studying French in high school. The play is about a woman who never appears but whose presence is all-important. All of the characters act in relation to her. Popeye is like that in the poem: everyone is making decisions about what he is going to do and going about his business. Popeye is a sort of superhuman creature who is dominating everything even though he is actually not there, though he makes a ghostly appearance at the end. You know—man proposes but Popeye disposes! Do you think your work is political in any sense? I think that poetry begins after the point where we have made our political decisions and have sorted out our priorities. People who read poetry, I think, are already disposed to act in a politically wholesome way and to exhort them to do that in a poem is to preach to the converted. It's another example of unnecessary effort. What about the case of Pound or Eliot whose political opinions were less than wholesome? I was talking about readers. Poets have been known to be monsters, and are permitted to be if their poetry is good enough. I know of no reader who has been converted to fascism or anti-semitism by reading Pound nor of any fascist who reads him for his political con­tent. But I think experiencing poetry makes one want to act on many different levels. A poem by Keats would make me wish to become politically involved, to make love—to do all kinds of things—but it doesn't have to point you in a particular direction. You want to get back in touch with life again, after you have had a strong poetical experience, in many different ways. The poem "Mixed Feelings" begins with a sensuous recollection, the smell of frying sausages, and reminds me very much of Proust 's novel and the way his recollections come out of the taste of the madeleine. Yes, Proust has been very important to me. Sometimes I wish I hadn't read him, as a matter of fact. Because one ends up sadder and wiser after reading him. Do you think the persona of the poet is important in your work? I don't know. I don't think very much about myself; I don't have a strong sense of myself as an individual. I can tell you how I came to write "Mixed Feelings,” though. I had taken a walk through the village which I frequently do before I write poetry and I had a first line that I liked but, as it turned out, had little to do with the poem. It was getting kind of late in the day and I wanted to come home and write something, so I took a taxi back. I had just started to wear glasses then. I could tell that my sight was getting worse all the time. I wasn't wearing them and the taxi had a photograph similar to the one in the poem pasted up in the back seat. Since that was what was there, it became the material of the poem. My difficulty in seeing the photograph was, of course, not something that everybody would have had. Perhaps I was cheating a bit by making it a sort of generalized condition but it got the poem going for me. Besides, everybody is a special case. Leopardi was a hunchback but his unhappiness speaks to all of us. When I got back home I thought about these girls who seemed like the girls in high school with names like the ones in the poem. So, in that sense my own past was in the background. I take a very trivial subject and talk about it in a trivial way. I make fun of it all by saying I “am not going to / Waste any more time thinking about them. I have already forgotten them . . .'' and then I make fun of that because we are all going to meet someday in the future. I think that having them come to life at the end of the poem is a result of my urge to deny the condition of death which the old, still photograph would seem to imply. It seems that the recollection of the past and the strange shapes that our recollections take the life of the unconscious really is very important to you. In fact, it leads me to believe that Freud and other psychological texts are as important to you as Stevens or Auden are. I haven't read much psychology except for Freud. Although I have been in psychoanalysis, I think I had been recollecting long before I paid to do so. Has the experience touched your work? It has but it would be difficult to say exactly how. It might have reinforced more regular writing habits. Being in the situation, at certain hours of the week, of saying what one has on one's mind undoubtedly influenced my writing. I still don't work regularly but I do work whenever I find the time. I no longer wait around for a "privileged moment." If I can find a spare half hour now I'll use it, whereas in the past, I felt I needed an unlimited stretch of uninterrupted time before I could write. Do you have any specific advice for younger writers? I would advise them to read as much contemporary poetry as possible and not to be discouraged by its strangeness, to give it a chance. I was just reading in Keats' letters where he says that a poet ought to begin by reading the works of his contemporaries rather than the poets of the past, that it is very helpful to realize that a poet not much older than the reader can say things in such a recent past and not too distant place. Also, I think it would be useful to consciously imitate some of the poets you have discovered whom you really like. That would be better than doing it unconsciously which you would probably do anyway. One advantage to reading a lot of contemporary poetry is that you can avoid writing like someone you haven't read yet. I will say to a student "You seem to have been influenced by so-and-so'' and it turns out the student has never heard of that poet. I don't think there is a poet alive, at least in the United States, who can live off of his poems. There is just no income and as a result everyone teaches, gives readings, writes for a magazine or works in some other unrelated job. How difficult is it for you to have to earn a living and then find time and energy to write? It is difficult. It's unfortunate in a way that poets can't live by selling their poems the way painters, if that it might have some unfortunate repercussions on a poet's work if that were the case and so in fact, I'm just as glad that we can't really sell our poems. It does force you to do something else and that something else seems to grow more and more intrusive as time goes by. In the case of those poets who do not make much money from their outside activities it becomes a tremendous problem. Nevertheless, I think the situation helps to discipline you. If you are determined to write no matter what then you'll write. You've always had to do it no matter what anyway—it has just become a little more dramatic. A favorite poem of mine from the Houseboat Days collection is "Wet Casements." That poem grew out of a conversation I had with a South American poet who came to see me several times. He would always act meek and embarrassed about taking up my time—over-apologetic. He would begin to ask questions that I found very deep and almost painful to contemplate. A strange transformation took place that interested me very much. At one point, it was almost as if we were seeing ourselves in each other. I was looking at him but it seemed as though I was looking at myself. He himself pointed out this phenomenon. The epigraph is a line that I've always wanted to use. I like that Kafka story very much. The difference between "he saw that it was raining" and "it was not raining much" seems to me slight but tremendously important. This is the kind of difference that interests me. When we started you said that you don't know very much about your work and that you'd really rather not know. Why is that? I'm not trying to fend off anything. I say it because I feel that way. I think almost any writer feels that way; it's a kind of superstition which probably has something to do with a fear of killing the goose that laid the golden egg. Most writers, for instance, will refuse to discuss their work in progress because they feel if they talk about it they may not write it. I used to feel that way myself, but I've found that I've become progressively less inhibited about talking about my writing. What are you working on now that As We Know is out? I've written the first draft of a collection of fifty poems, all sixteen lines in length. The problem now is to go back and revise them. I don't know except that I've never written a book of fifty sixteen-line poems before. Also, after having written a poem as long as "Litany," I wanted to write something shorter. The fact that they are just a little longer than the sonnet seems to me to break up the specious microcosm of the sonnet form. Perhaps I wanted to find an equivalent, concise form which would, nevertheless, not have the artificial brevity of the sonnet. JOHN ASHBERY (1927–2017) was a preeminent American poet. Over the course of a highly prolific career that spanned seventy years, he won nearly every major American prize for poetry and was widely viewed as one of the greatest and most influential American poets of the second half of the twentieth century. DAVID REMNICK is a Pulitzer Prize-winning writer and journalist who has served as Editor of The New Yorker since 1998. He interviewed John Ashbery while still an undergraduate at Princeton.